The ransom ware that I’m covering here is mostly a threat to computers, rather than websites, but I’ve covered it because keeping your computer clean and safe is a key part of keeping your website clean and safe – as I explained here. A new iteration of ransomware has appeared that threatens to greatly increase the risks to owners not just of Windows computers but of Mac and Linux machines as well. 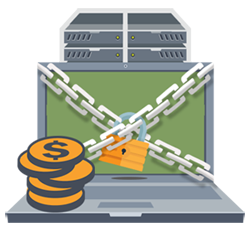 Ransomware is malicious software that encrypts the files on your computer, preventing you from accessing them, and forces you to pay money in order to unencrypt them. Ransom is a fast growing trend in the world of cybercrime – I described two examples here of companies that were hacked and held to ransom, one of which was put out of business. So what’s different about this new iteration of ransom ware? You can become an affiliate, get the ransomware source code and start extorting money for yourself. Once you join as an affiliate you even get a control panel where you can configure settings such as how much money to extort from your victims, the messages that are displaid to them, and so on. As a result, the growth rate in the threat of ransomware is likely to become exponential as people with a criminal mind set and the need for a quick buck sign up. Protecting your computer (and website) from being hacked is a responsibility not only to you, but to the online community at large. Not only will failure to protect yourself cause you major problems, it helps the cyber criminals to perpetuate their crimes on others, because your website or your computer becomes an ‘asset’ of the individual who hacked it. These ‘assets’ are controlled by the hacker and used to participate in Distributed Denial of Service attacks, the spread of malicious software, spam campaigns and any other nasty scheme they come up with. Never fall into the trap of believing your website is too small for anyone to bother with, or that you only use your computer for unimportant things. Every website and every computer is a potential asset for a hacker because, once they have control of them, your computer or website are used to commit all sorts of cyber-crimes. You can read more details on this latest incarnation of ransomware here.